Neither the portrait nor the lady were among the most famous occupants of Tudor Place. But, nonetheless, she and her portrait reached my sole and haunted my memory of the day until I finally reached out to Tudor Place to tell me more about Caroline Ogden-Jones Peter. The docent I talked with had never been asked about Caroline Ogden-Jones Peter prior to my inquiry. Could this be a sign of my intelligence or my deep desire to "know all"? My delightful enchantment with Caroline Ogden-Jones Peter began while reading a poster prior to our tour of Tudor Place. There she was, her 1920’s fashion portrait, as the last lady of the house wearing a fashionable “bright green” cloche-style hat and colorful scarf. My initial thought was why so plain a portrait for “the Lady of the Manor.” Her piercing eyes penetrated my sole . . . with an invitation to tea. . . You see all tea people connect all things to tea. As I watched the other tourists, I realized that no one else was particularly intrigued with this portrait or lady. The tour entered the dinning room and to my delight there was the “The Green Hat” portrait positioned before a table set for casual afternoon tea. The piercing eyes once again sent an invitation to tea and conversation. I ask about the portrait and was told it was Caroline Ogden-Jones Peter, painted by her husband Armistead Peter III. Caroline had chosen to exemplify a woman from the novel, “The Green Hat” by Michael Arlen written in 1924. Once I discovered the novel captured the atmosphere of the 1920s and was about a femme fatale who races around London and Europe in her yellow Hispano-Suiza in a swirl of romantic intrigue . . . I was hooked. I had to read the book and I understood Caroline’s invitation. 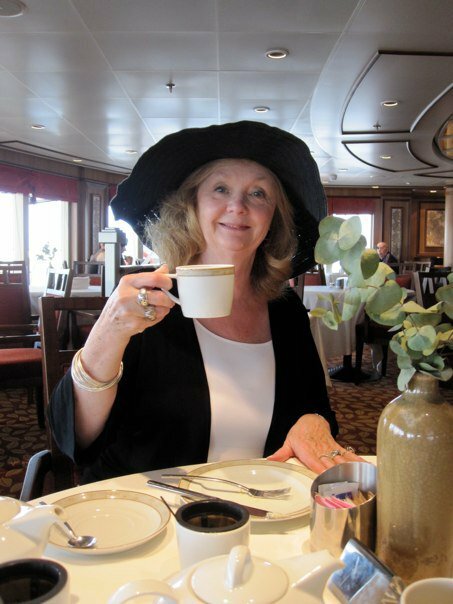 When the book arrived (had to be ordered from London)(www.capuchin-classics.co.uk), I learned “The Green Hat” was adapted for screen with Greta Garbo as Iris Storm . . .My enchanted tea is in full swing with guests Caroline Ogden-Jones Peter, Greta Garbo, Iris Storm, and myself . . . Ladies who wear hats . . . hats that have a story to tell . . .ladies with a verbal smartness, youthful cynicism and the spirit of rebellion.